What impact can the next 35 Littles make on the future of our community? We need you to help us find out. There are more than 130 Littles waiting to find their Bigs. 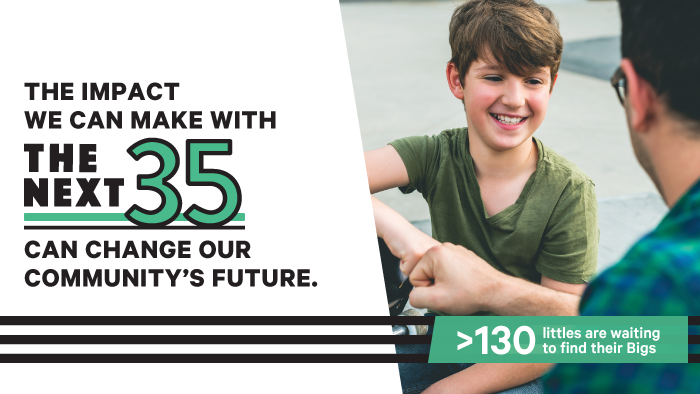 We are recruiting 35 Bigs in 35 days to celebrate the 35 years we’ve been in operation in hopes we can be one step closer to eliminating our wait list by January 2019. We are also looking to the next 35 years of our agency, starting with a brand evolution. We are joining 300 Big Brothers Big Sisters agencies across the country to launch a new logo, new color scheme and new priorities on Oct. 1. Join us at one of the following events to learn more about the most impactful volunteer experience you’ll ever have! 45-minute, no-commitment meeting to learn about each of our programs, our rules, and our requirements. Call in to win prizes and sign up to learn more about becoming a mentor. Join us at O’Reilly Hospitality Center for free samples of Hinode and Meadowview Gin while learning more about our volunteer opportunities. Stop by our booth at MSU’s annual event where students, staff and faculty learn about the area’s service opportunities. Email therzog@bigbro.com to sign up. Come to this event, co-hosted by State Farm, to find out what our new logo looks like and hear from us what the next 35 years looks like.